Roku isn’t only maintaining its lead as the top streaming media player device in the U.S., it’s increasing it. 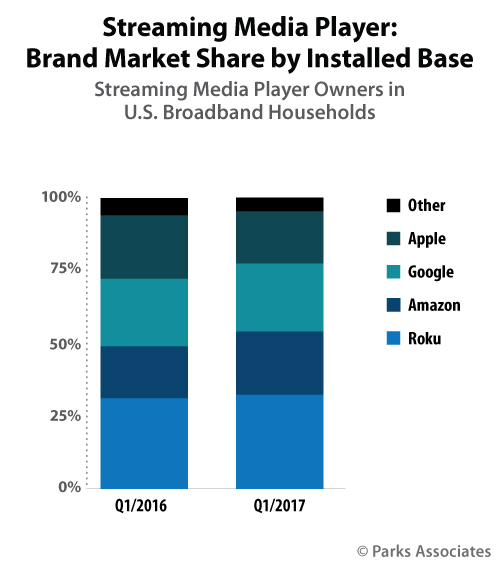 That’s the conclusion from the latest industry report out today from market intelligence firm Parks Associates, which states that 37 percent of streaming devices in U.S. households are Roku devices, as of the first quarter of this year. That’s up from 30 percent in the same quarter last year, the report notes. The growth is coming at the expense of Roku’s top competitors, like Apple and Google, with only Amazon’s Fire TV able to increase its install base during the same timeframe. Fire TV devices are in 24 percent of U.S. households, as of Q1 2017, up from 16 percent last year. That climb allowed Amazon to snag the second position from Google’s Chromecast, which has an 18 percent share. Lagging behind, Apple TV’s market share fell to 15 percent – a drop that Parks Associates Senior Analyst Glenn Hower attributes to Apple TV’s price point. “Higher-priced devices, such as the Apple TV, have not been able to keep up with low-priced and readily available Roku devices, which can be found at Walmart for as low as $29.99,” he said. Roku last fall overhauled its line of streaming players with the intention of plugging every hole in the market. That strategy is seemingly paying off. There’s now a Roku device to meet any consumer’s needs – whether that’s an entry-level, portable and affordable “stick,” to rival the Fire TV Stick or the Chromecast dongle, or a high-end player with 4K and HDR support, lots of ports, voice search remote, and other premium bells and whistles. Roku just shared its own growth numbers, too, as reports swirl regarding the company’s IPO plans. Last month, it announced the Roku user base has now grown to 15 million monthly active users in the first half of this year, up from 13 million in 2016. Chromecast will have 36.9 million users this year (or a 22% share); Amazon Fire TV will have 35.8 million users in 2017 (21.3%); and Apple TV will have 21.3 million users (12.7%), eMarketer said. The two reports’ numbers differ on which device earns second place. That’s because one is measuring connected TV users while the other is measuring devices owned. Parks Associates gives the second place crown to Amazon, while eMarketer’s forecasts that Chromecast will be close behind Roku this year. However, one thing that’s true for both reports is Apple TV’s trailing position. That’s something that Apple may address later this year with the release of new Apple TV device, which is rumored to support 4K and HDR video. To be fair, though, even with a refreshed device, Apple wouldn’t really be competing with all of Roku’s product line; rather it’s only targeting those who would be in the market for the high-end Roku Ultra streaming player, not a basic device or stick.